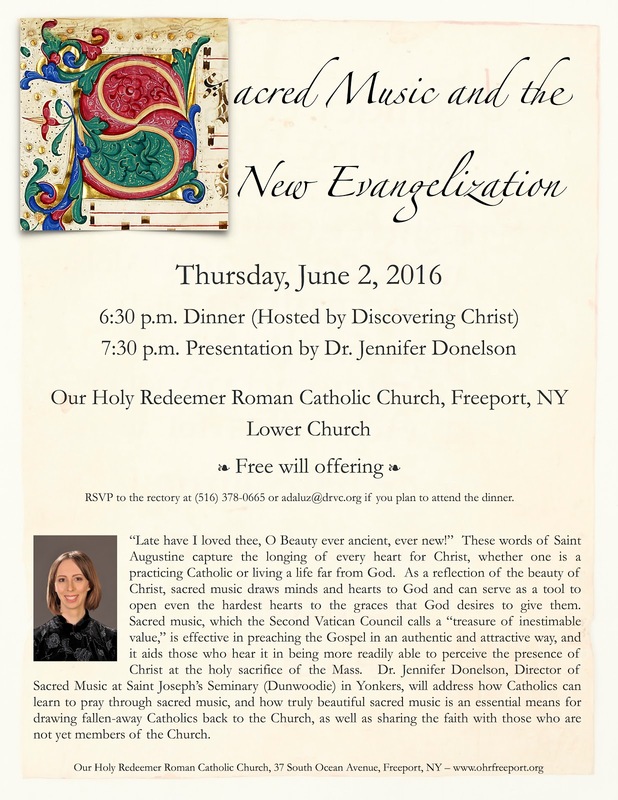 The Church of Our Holy Redeemer in Freeport, New York, is hosting me for a talk and a chant workshop. If you're in the area, I hope you'll be able to join us. RSVP to the rectory at (516) 378-0665 or adaluz@drvc.org if you plan to attend the dinner. “Late have I loved thee, O Beauty ever ancient, ever new!” These words of Saint Augustine capture the longing of every heart for Christ, whether one is a practicing Catholic or living a life far from God. As a reflection of the beauty of Christ, sacred music draws minds and hearts to God and can serve as a tool to open even the hardest hearts to the graces that God desires to give them. Sacred music, which the Second Vatican Council calls a “treasure of inestimable value,” is effective in preaching the Gospel in an authentic and attractive way, and it aids those who hear it in being more readily able to perceive the presence of Christ at the holy sacrifice of the Mass. 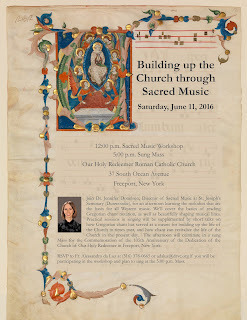 Dr. Jennifer Donelson, Director of Sacred Music at Saint Joseph’s Seminary (Dunwoodie) in Yonkers, will address how Catholics can learn to pray through sacred music, and how truly beautiful sacred music is an essential means for drawing fallen-away Catholics back to the Church, as well as sharing the faith with those who are not yet members of the Church. Join Dr. Jennifer Donelson, Director of Sacred Music at St. Joseph’s Seminary (Dunwoodie), for an afternoon learning the melodies that are the basis for all Western music. We’ll cover the basics of reading Gregorian chant notation, as well as beautifully shaping musical lines. Practical sessions in singing will be supplemented by short talks on how Gregorian chant has served as a means for building up the life of the Church in times past, and how chant can revitalize the life of the Church in the present day. The afternoon will culminate in a sung Mass for the Commemoration of the 105th Anniversary of the Dedication of the Church of Our Holy Redeemer in Freeport, New York. RSVP to Fr. Alessandro da Luz at (516) 378-0665 or adaluz@drvc.org if you will be participating in the workshop and plan to sing at the 5:00 p.m. Mass.